I took off my QID to short the Nasdaq with a small loss. Roughly a 2% loss. I was happy to take a scratch when the price action was going against the position. All morning Nasdaq ripped higher and higher. I nailed the setup just waited to long to get short. Didn't expect such a huge gap down. I'm still short THLD and so far the price action is good. I've been watching the USD and I see the long setup on the dollar breakout. This looks like a steady uptrend is going on. The crashing of gold and copper point to dollar strength as well. 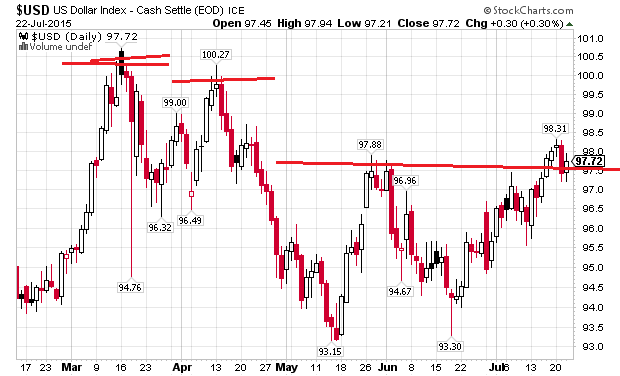 Gold is basically synergistic with the dollar as an inverse. 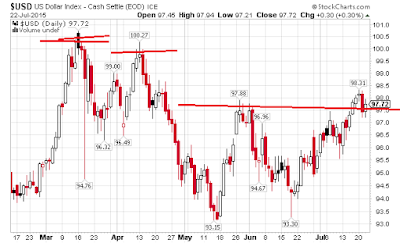 It's not a multi timeframe breakout on the dollar IF it happens here but the upside is good. I will probably look at ETF UUP long.